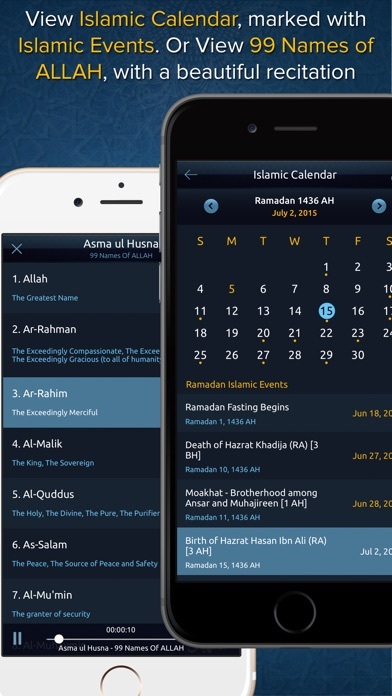 Get your hands on the most advanced and comprehensive Islamic mobile application that intends to serve as a lucid Islamic resource for the devout followers of Islam. The app is geared towards providing all the requisite Islamic information and knowledge as and when required. 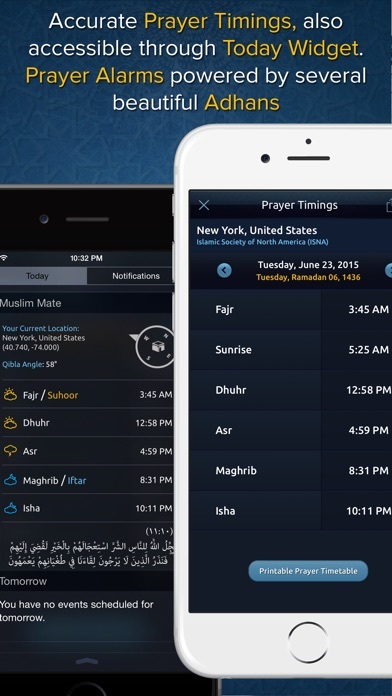 KEY FEATURES - Accurate Prayer Timings calculated for your exact geographical location. - Alarm notifications for prayers with several beautiful Adhans (Call to Prayer) to choose from for alarm sound. Listen to Full Adhan in the lock screen notification, even when the app is not running. - Complete Holy Quran, with multilingual phonetic transliterations, translations & audio recitations. Beautiful original scripts & fonts including IndoPak, Uthmanic, & Mushaf al-Madina. You can pinch to zoom & change font size! - 'Follow Reciter' feature to listen to the Quranic recitation followed by the Translation recitation. - 60+ most authentic Quran Tafseers from renowned scholars in English, Arabic & Urdu languages. - Word-by-Word meaning, Quranic Grammar, Syntax & Morphology for each Quran verse. - Fully searchable Quran, allowing you to search for any text in the Arabic Quran, Transliteration, Translation or Surah name. You can also Bookmark, Share, Annotate or Copy any verse - 'Hadith Collection' section, containing complete Arabic Hadiths text & their translations for the following Hadith books: Sahih al-Bukhari, Sahih Muslim, Sunan an-Nasa'i, Sunan Abi Dawud, Jami` at-Tirmidhi, Sunan Ibn Majah, Muwatta Malik, 40 Hadith Nawawi, + more. Hadith section also supports searching. - 'Prayer Log' feature, which allows you to keep a record of your offered & missed prayers. View your prayers' detailed statistics & graphs! - 'Salah Guide' section, containing detailed guidance with pictorial illustrations & audio recordings for offering the Salah / Prayer. Very useful for kids, new converts to Islam, or anyone looking to perfect their Namaz knowledge. - Qibla Compass, which also allows you to orient your device towards Qibla & find its exact direction. 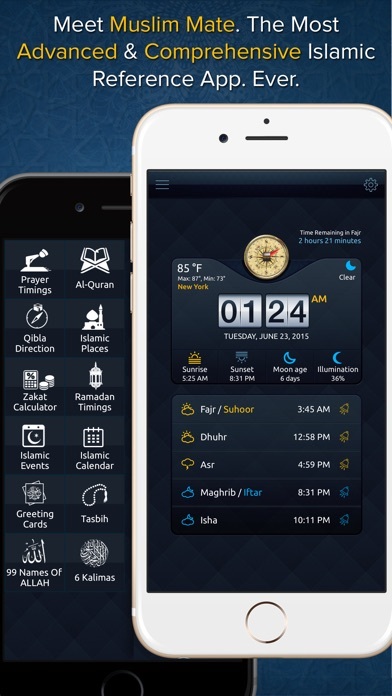 - Access Prayer times & Qibla compass directly from the pull down Today Widget menu. 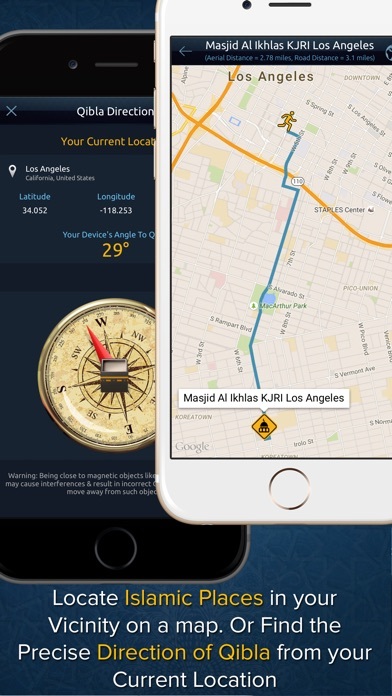 - Locate Islamic places in your vicinity on a zoomable map, which also shows you the exact route & distance from your current location. You can look for Mosques, Halal Restaurants, Butcher Shops, Schools, Clothing Stores etc. - Ramadan Timings, for current or any past / future years. Print hi-resolution ramadan timetable. 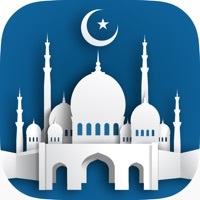 - Hisnul Muslim section, contains dua's for different aspects of life - 99 Names of ALLAH (Asma al Husna), with meanings & a beautiful audio recitation - 6 Kalimas, with phonetic transliterations, translations & recitations - Accurate Zakat Calculator, with history for all your previous calculations - Islamic Events, listing significant events from the Islamic history - Islamic Calendar, marked with Islamic Events. Convert between any Gregorian Calendar date & Islamic date - Exclusive Greetings Cards for Ramadan, Eid al-Fitr, Eid al-Adha & Hajj. - "Hajj & Umrah Guide" section, with detailed instructions for Hajj & Umrah performance. Also contains a comprehensive guide about the historical places to visit in Mecca & Medina - "Mecca / Medina Live" section. Reignite your faith by watching live streaming from the Haramain (The Holy Ka'bah & The Prophet's Mosque) - Digital Tasbih with sound & vibration options. You can add as many Tasbih types as you want. It also maintains a history/log, enabling you to refer to exactly what, when & how much Tasbih you recited in the past - Listen to Quran recitation, Adhans, 99 Names of ALLAH & Kalima recitation even when the app is in the background - View current weather information & weather forecast for the next 5 prayer times - Watch Face Complication in the Muslim Mate's accompanying Watch app. You can view the time remaining in the next Salah with a quick glance at your watch. Please keep sending us your valuable suggestions. We are continuously working on further improving the app. The app doesn't work offline to tell u the times of prayers also this reminder of Ayat daily can't be stopped and always active! The app is good to be free not paid one! The Quran fonts change the letters of Quran words and can't be connected. Should be Free App not paid one! Letters are hidden on the right side of the page when I'm reading Quran and it doesn't matter what size I choose. What would I do without Muslim Mate?